Group of hard-paste porcelain. 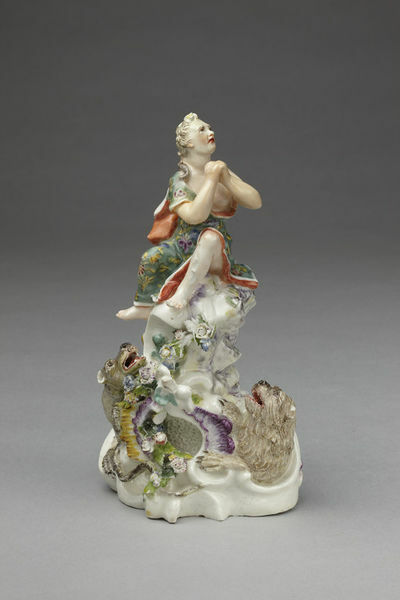 On a high, scrolled rococo base, from folds of which appear a wyvern, a snake and a lion, is seated a female figure, perhaps intended to represent Hope. A mark against her leg suggests that she held a spear in her now damaged right hand. Ducret, Siegfried. 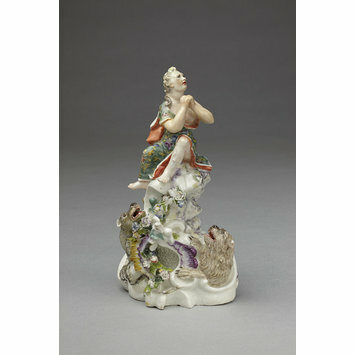 Unknown porcelain of the late 18th century. Frankfurt am Main, L. Woeller Verlag, 1956, Plate 3. Previously attribted to perphas Pfalz-Zweibrücken porcelain factory on the register.